This little charmer kept his mummy waiting almost two weeks past his due date, but there’s no doubt he was certainly worth the wait. And with a quick & easy reschedule in the Samphire diary, this adorable boy came to see me in the studio for his newborn portraits when he was a little over two weeks old – the perfect age for this style of photography. 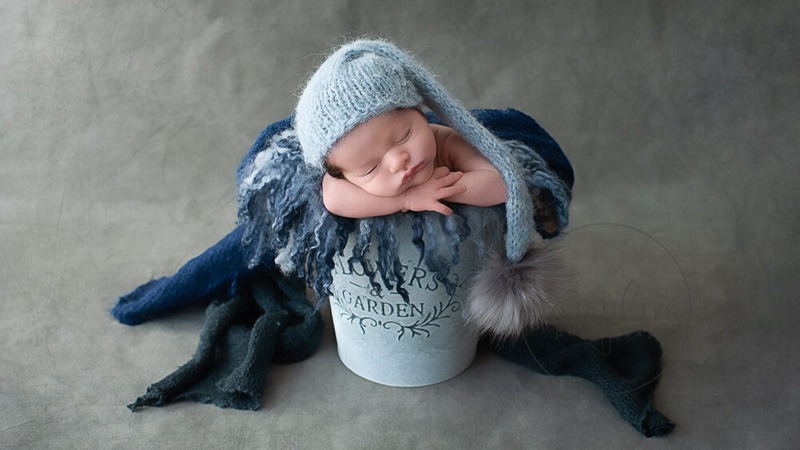 So with a soft blend of blues and greys, with plenty of knits and layers and an adorable teddy bear hat, we captured some truly gorgeous images of little Theo for Mum & Dad to treasure. I have a wide selection of wonderful wraps, layers and props but am always happy to include items that are uniquely personal to the family. 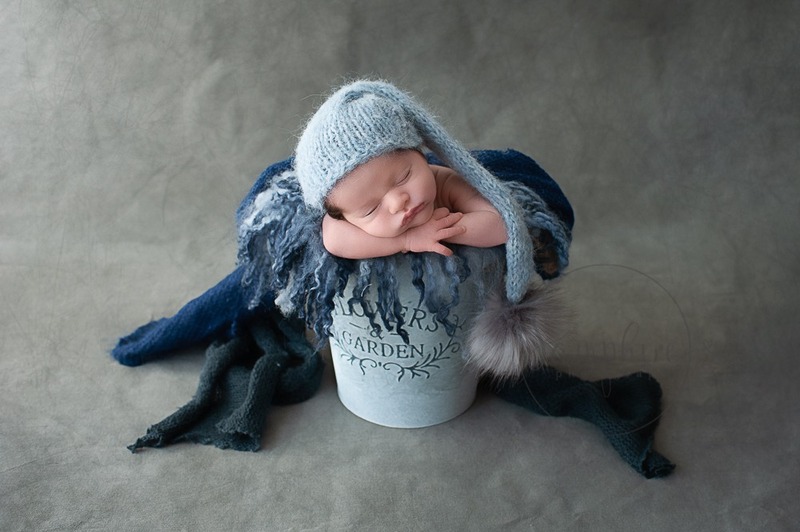 If you have an idea in mind to incorporate in your newborn session then please do feel free to discuss it with me to ensure we include it in your images. In the case of this little man, Daddy is a lorry driver so Mum had brought along a Tonka truck to carry this very special load. I love grey and yellow together so think it looks fabulous against my slate grey hand-painted backdrop from Bespoke Backdrops. They also requested an image of their rings with Theo – oh! 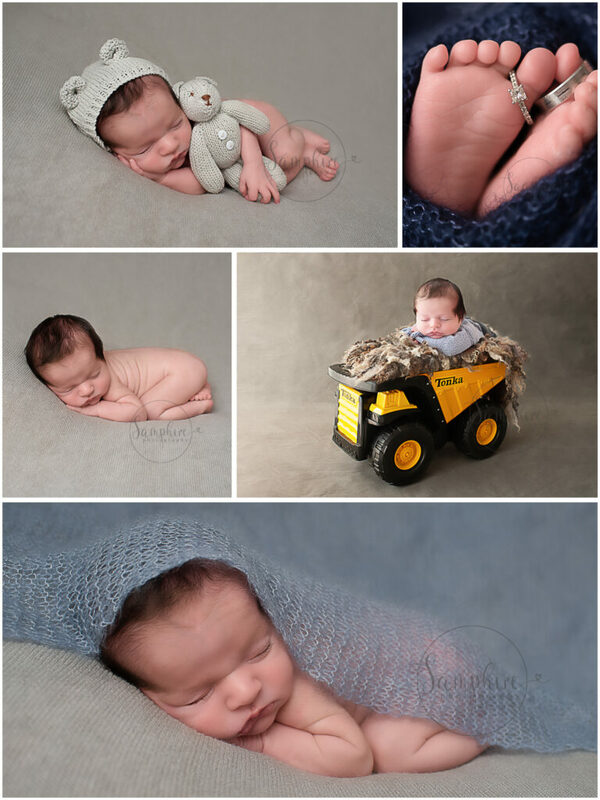 just look at those tiny toes – which makes this a truly personal and unique portfolio of memories.